New York, NY: Farrar Straus & Giroux, 1941. Text/NEW & Bright. Hardcover/VG; strong & sound w/edge rubs & fading to spine. DJ/None. PO name to fEP. Towards understanding masochism. Austrian-born psychoanalyst Theodor Reik (1888 - 1969), one of Freud's first students, and pioneer of lay analysis in the U.S., examines the concept that "man is the an animal which seeks pleasure and avoids pain". He wonders whether man also "finds pleasure in suffering disgrace and humiliation? "; and probes into why some of us, unconsciously, strive for physical & pychic pain, deliberately "accepting sacrifices, shame, humiliation, and disgrace"? 439 pgs, 33 chapters in 8 parts. Reik examines how engagement in self-punishing,or provocative behavior, is used to induce guilt in others, and, thereby, harvest a sense of secret superiority and be rewarded by "victory through defeat" --- not entirely unlike saints & martryrs perceive their temporal sufferings, unbeknowst to most as joyful rewards towards securing eternal happiness.. First Edition. Hard Cover. Very Good/No Jacket. Vintage/Psychology. New York, NY: Farrar Straus & Co, 1954. Text/NEW & Bright. Hardcover/Good; sound w/discoloration to covers verso, wear to all leading edges & surfaces, and loss to upper spine edge. DJ/None. PO name to fEP. A discourse on non-verbal communication. Austrian-born psychoanalyst Theodor Reik (1888 - 1969), one of Freud's first students, and pioneer of lay analysis in the U.S., examines how subtle nuances of interpersonal communication are expressed & perceived at unconscious levels which can only be decipherable by analysts looking inwards and listening with the third ear (term borrowed from Nietzsche). Volume contains numerous clinical examples detailing subtle, influencial clues expressed in the patients patterns of behaviors such as dress, peculiarities in gestures, flickering of eyes, and even the warmth, clamminess, roughness or smoothness of the skin conveyed in shaking of the hand ---- all to which we respond to unconsciously yet influences our opinions. Since minute movements speak as powerfully as words, one needs to turn attention inward. 514 pgs, 46 chapters in4 parts: Part I, "I am a Stranger Here Myself"; II, The Workshop; III, Two-Way Street; and IV, The Language of the Soul, followed by "Leave-Taking". Strong copy w/tired covers.. First Edition. Hard Cover. Very Good/No Jacket. Vintage/Psychology. New York, NY: G.P. Putnam's, 1966. Text/Bright, Clean, AS NEW. Black linen boards/Fine. DJ/Poor/price-clipped, closed edge tears, and rubs to edge & surface. Upper text block dyed yellow. Embossed PO stamp to title page, and sticker removal scar to front cover verso. 1966, 2nd novel from Berkeley-born John Nicholas (1940 - ), which was adapted to film under the same title in 1988. Set in World War II. The story of precocious Wendall Oler, who is but ten years old when the book opens. His mother had died ("I didn't like her anyway"), his father joined the Marines, and he's to live with his grandparents, and aunt & uncle in rural Stebbinsville, Vermont. In his new home, loneliness persists as he is exposed to his grandfather's debts; his uncle and aunt's romantic troubles; a sick librarian thinking of nothing but for death; and Duffy, a returned war casualty, who may kill. An extraordinarily hard childhood.. First Edition, First Thus. Hard Cover. NEAR FINE/Good. Vintage/Novel. New York, NY: Brunner/Mazel, 1986. Text/BRAND NEW & Bright. Black linen boards w/gilt embossed spine/Fine. DJ/NF w/short closed tear to lower back edge. Light brown spotting (acidic paper reaction) to upper text block. 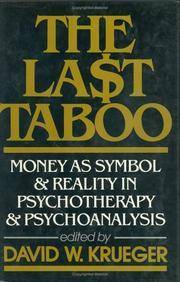 Unique & pragmatic analysis of the exchange of money, its symbolism and social meanings, between patients and therapists --- a subject, emotional and often taboo, so heavily laden with meaning that can sabotage the therapy itself. Collection of 22 essays. 261 pgs presented in 3 parts: I, Theoretical & Symbolic Meanings of Money; II, Money in the Therapist-Patient Relationship; and III, Payment Structures & Management Issues/. First Edition, 2nd Printing. Hard Cover. NEAR FINE/Near Fine. First Edition 2nd Printing. Miami, FL: MedMaster, 2005. Text/BRAND NEW & Bright. Softcover/NF w/trace soiling to back cover. First published 1900; this is the 5th Edition of 2005. Succinct guide for health professionals caring for patients receiving psychotropic medication. 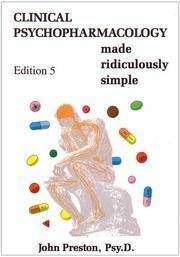 80 pgs, 8 chapters: 1, General Principles; 2, Depression; 3, Bipolar Illness; 4, Anxiety Disorders; 5, Psychotic Disorders; 6, Miscellaneous Disorders; 7, Non-Response & "Breakthrough Symptons" Algorithms; and 8, Case Examples, followed by 3 appendices.. 5th Edition. Soft Cover. NEAR FINE/None as Issued. New York, NY: The Guilford Press, 1986. BRAND NEW & Collectible. First Edition, First Thus. Reference/resource. Asessement of issues in the field of child-clinical neuropsychology focusing on ages between 5 and 16 years. Augmented with case studies, text designed to assist speech pathologists & special education specialists involved in remedial education. 285 pgs in 7 chapters: 1. Introduction; 2, Case Illustration; 3, Common Neurological Disorders of Children; 4, Deseases of Childhoon That May Affect Higher Nervous System Functioning; 5, Special Problems in Academic Remediation; 6, Special Problems in Adaptive Behavior; and 7, Summary of Principles & Future Directions, followed by Appendix: Description of Tests Administered to Children (5-15 years).. First Edition, First Thus. Hard Cover. NEW - COLLECTIBLE/New. First Edition, First Thus. New York, NY: Paulist Press, 1982. BRAND NEW COPY w/trace wear to softcover. Light brown spotting (acidic paper reaction) to upper text block. Valuable self-teaching guide on how best to confront the multi-faceted challenges in Church leadership. 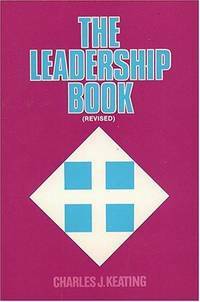 First published 1978; this is the Revised Edition of 1982. 133 pgs in 12 chapters: 1, The Dilemmas of Leadership; 2, The Two Dimensions of Leadership; 3, Leadership: Reading the Group; 4, Leadershiip: Handling Conflict; 5, Improving Our Leadership Style; 6, Leadership & Decision Making; 7, Leadership & Planning; 8, Leadership & Management; 9, Leadership & Delegation; 10, Leadership & Power; 11, Leadership & Time Management; and 12, Christian Leadership.. Revised Edition, First Thus. Paperback. NEW/None as Issued. Revised Edition. Chicago, IL: Delphian Society, 1939. Text/BRAND NEW. Gilt embossed maroon boards/Fine. DJ/None (as Issued?). Gilt to upper text block. A 3-part course on the historical, psychological, philosophical & scientific backgrounds of modern art. This is Part One only; first published 1936. 257 pgs w/line drawings & b/w fotos in 17 chapters: I, The Horizon of Modern Art; II, A Modern Conception of Art Development; III, Vision - A New Key to Aesthetics; IV, Cultural Waves; V, Our Position Today; VI, The A.B.C. of Art Language; VII, The Elements of Personal Expression; VIII, The Elements of Composition; IX, Creation in Nature & Art; X, Two Fundamental Approaches to Life; XI, Intuition; XII, Old & New Art; XIII, Contemporaneous Art; XIV, Changing Art Evaluations; XV, The Conquest of Space; XVI, Form & Speed; and XVII, Futurism.. Part One, Reprint of 1939. Hard Cover. NEW/None (as Issued?). Vintage/Modern Art. Chicago, IL: Delphian Society, 1939. Text/BRAND NEW. Gilt embossed maroon boards/Fine. DJ/None (as Issued?). Upper text edge in gilt. A 3-part course on the historical, psychological, philosophical & scientific backgrounds of modern art. This is Part Three only; first published 1936. 824 pgs w/photo illustrations, covering chapters 38 thru' 53: The chapters are: 38, The Climax of the Revolt Against Reality - Surrealism; 39, Art Patrons - Surrealism in Everyday Life; 40, Art in America - I; 41, Art in America - II; 42, Art in America - III; 43, Art in America - IV; 44, Art in America - V; 45, Art in America - VI; 46, Mural Art in Pre-War America; 47, Psychological Background of Modern Murals; 48, The Mexican Renaissance; 49, Recent Murals in the United States; 50, Modern American Sculpture; 51, Functionalism; 52, The Birth of Modern Architecture; and 53, Frank Lloyd Wright & the International Style, followed by Appendix & Index.. Part One, Reprint of 1939. Hard Cover. NEW/None (as Issued?). Vintage/Modern Art. Chicago, IL: Univ of Chicago Press, 1987. Text/BRAND NEW & Bright. Softcover/NF w/faint creasing to lower back corner. First Edition, First Printing. History of psychoanalyis. 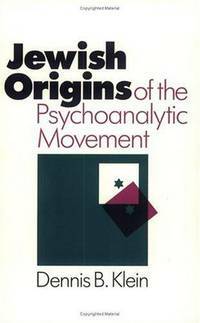 During the first four years of studies in psychoanalysis all members were European Jews. Stimulating historical inquiry into Jewish self-conceptions, experiences in Jewish acceptance & repudiation, particularly in the German culture of the time, Freud's own family issues, and the re-making of the discipline. 198 pgs, 5 chapters: 1., Assimilation & Dissimiltation; 2, Freud & the Psychology of Movement; 3, The Frefiguring of the Psychoanalytic Movement: Freud & B'nai B'rith; 4, The Psychology of the Follower: Otto Rank; and 5, Conclusion, followed by appendix.. First Edition, First Printing. Soft Cover. NEW/None as Issued. First Edition, First Printing. Berkeley, CA: Univ of California Press, 2000. BRAND NEW COPY w/slight lean to spine. Exploring the geography of the human brain. A look inside that small, dense mass of gray matter with award wining British medical and science journalist Rita Carter as guide. 224 pgs w/some 150 illustrations. 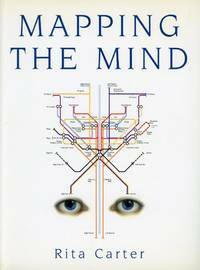 On unearthing secrets of the brain, and our very being. Subjects delve into one's obsessions & compulsions that may be governed by biological mechanisms --- could addictions stem from dysfunction in the brain's reward system via genetics or drugs, or both? And extraordinary religious experiences, seemingly different reactions of men and women to the same events, and possible physiological triggers of a "gay brain," as well as reactions to "phantom limbs", dyslexia, autism, and manias? . First Edition, 6th Printing. Soft Cover. NEAR FINE/None as Issued. Illus. by MoonRunner Design (Illustrations). New York, NY: Basic Books, 1976. Text/BRAND NEW & Bright. Linen boards/Fine. DJ/VG; sound w/rubs, nips & short closed tears to edges and light surface wear. Dyed upper text block. Environmental Psychology. Thought provoking exploration of how variations in physical surroundings (such as color, light, temperature, architecture, etc) influence peoples' feelings, moods, and behavior. Author, Iranian-born UCLA psycholgist Albert Mehrabian (1939 - ) is known for studies on verbal and nonverbal (body language) as equally powerful , though sometime subtle, modes of human communication. 354 pgs, 30 chapters in 7 parts: I, Basics; II, Intimate Environments; III, Residential Environments; IV, Work Environments; V, Therapeutic Environments; VI, Play Environments; and VII, Communal Environments, followed by Epilogue.. First Edition, First Printing. Hard Cover. Very Good/Very Good. First Edition, First Pinting. Chicago, IL: Thomas More Press, 1984. Text/BRAND NEW w/light brown spotting (acidic paper reaction) ro upper & leadingf text blocks. DJ/NF w/trace edge rubs. A lucid exploration and review of human emotions that are a part of daily life, and coping devices to expell negative thoughts of rage and, in the exteem, even suicide. 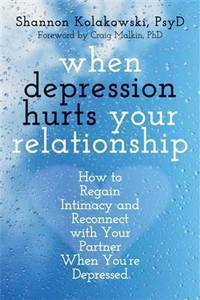 30 chapters in 3 parts: I, Understanding Human Feelings; II, Levels of Heathy & Unhealthy Functioning; and III, Coping with Pailful Feelings.. First Edition, First Thus. Hard Cover. NEAR FINE/Near Fine. First Edition, First Thus. New York, NY: Random House, 1996. Text/3 folded corners else NEW. Bi-color boards/Fine. DJ/Fine. 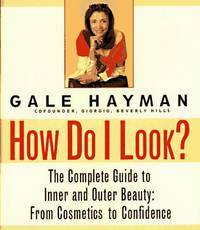 A discourse, an excursion, practical advice in lifestyles for the American women of all ages from Gale Hayman, co-founder od Beverley Hills boutique and devotee to American women's concerns on personal beauty, fashion, health and self-satisfaction. 253 pgs, lavishly illustrated, in 4 parts: Part 1. How Do I Look? ; 2, How Do I Dress? ; 3, How Do I Live? ; and 4, How Do I Feel?. Stated First Edition. Hard Cover. NEAR FINE/New. Illus. by Durell Godfrey (Illustrator). First Edition, First Thus. San Jose, CA: Pele Yoetz Books, 1987. NEW & COLLECTIBLE. First Edition, First Thus. Author signed. Palestine-born Joseph M. Papo (1902 -) and first educated in Egypt traces the experience of Sephardic Jews immigrrations and resettlemenst in the USA over time. A tale of of a people on becoming an American. First, in the 17th century, the first arrivals came. These first Sephardic-Americans will have problems welcoming subsequent commers. Rich chronicle of human endeavors. 450 pgs,, 5 pats: Part I, Transplanted Roots; II, The Eary Years :III, The Seccond Generation & Beyond; IV, Appendices; amd V, Addenda w/Notes & Glossary.. Author Signed. First Edition, First Thus. Hard Cover. NEW - COLLECTIBLE/New. First Edition, First Thus. New York, NY: Garland Publishing, 1992. Text/Marginalia & folded corner to pg 103, else Bright, Clean, AS NEW. Psychology of learning. Bibliography of books and essays from scholarly journals, popular magazines, personal journals, tapes & films pertaining to accomplishments in late mid-life and the later years. Reference and resource to admirable, continuing accomplishments. 149 pgs. . First Edition, First Thus. Hard Cover. NEAR FINE/No Jacket. New York, NY: HarperPerennial, 2006. Text/BRAND NEW & Bright. First published in 1956. 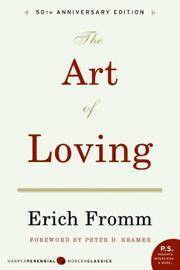 Classic discourse on love based on the premise that it requires both knowledge and effort. 50 the Anniversary Edition. Text in 4 parts: Part I, Is Love An Art? ; II, The Theory of Love; III, Love And Its Disintegration in Contemporary Society; and, IV, The Practice of Love. . First Edition, 11th Printing. Soft Cover. NEW/None as Issued. 50th Anniversary Edition. New York, NY: Little, Brown & Company, 2015. BRAND NEW COPY. Coloring book to the metropolis of New York City by artist and designer Zoé de Las Cases. With color pencils, markers, crayons or inks as you revisit the Big Apple you know and dreamt of in being ... from wonders of the bustling streets to the extraordinary variety of plain, old telephones one confronts, as well as daily sundries. All that makes up life one's sees, experiences, but often short time to truly enjoy (like one carrot, one martini, one bottle of ketchup! ; how about lavender?). For moments waiting for one event to pass and the next to begin. BONUS: Moments of creativity, sheer enjoyment, and calm.. First Edition, 3rd Printing. Soft Cover. NEW/None as Issued. Illus. by Zoe De Las Cases (Illustrator). New York, NY: John Wiley & Sons Inc, 1970. BRAND NEW COPY w/trace wear to softcover. Volume in the John Wiley Behavior Pathology Series. 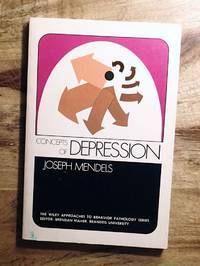 Overview of depression and mania by Joseph Mendels of the Univ of Pennsylvania. Central symptoms being sadness, pessimism and self-dislike along with short on engery, motivation and ability to concentrate. 124 pgs in 11 chapters: 1, Introduction; 2, Clinical Features; 3, Classification of Depression: Major Syndromes; 4, Classification of Depression: Development & Application; 5, Psychological Theories; 6, Social & Cultural Studies; 7, Biochemical Studies; 8, Psychophysiology; 9, Genetics; 10, Psychological Texting & Rating Scales; and 11, Treatment of Depression, followed by 3 appendices.. First Edition, 6th Printing. Soft Cover. NEW/None as Issued.